A quick post with a card for the Card Positioning System 5th anniversary celebration. 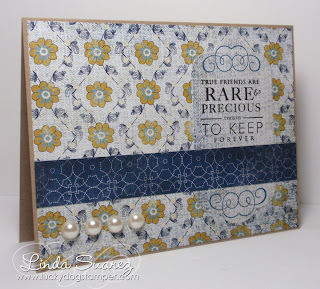 This card was made using the Day 9 sketch and some new patterned paper I picked up at my local scrapbook store today. I love the simplicity of this sketch! Love it Linda! And the pearls add a great balance to your card! Such beautiful papers, paired with a wonderful sentiment! So true! Thanks for playing my challenge!